The reason for the 5.3 arcsecond offset between the IERS Reference Meridian and the Airy transit circle is that the observations with the transit circle were based on the local vertical, while the IERS Reference is a geodetic longitude, that is, the plane of the meridian contains the center of mass of the Earth. The International Hydrographic Organization adopted an early version of the IRM in 1983 for all nautical charts. The IRM was adopted for air navigation by the International Civil Aviation Organization on 3 March 1989. Tectonic plates slowly move over the surface of Earth, so most countries have adopted for their maps an IRM version fixed relative to their own tectonic plate as it existed at the beginning of a specific year. Examples include the North American Datum 1983 (NAD83), the European Terrestrial Reference Frame 1989 (ETRF89), and the Geocentric Datum of Australia 1994 (GDA94). Versions fixed to a tectonic plate differ from the global version by at most a few centimetres. However, the IRM is not fixed to any point on Earth. Instead, all points on the European portion of the Eurasian plate, including the Royal Observatory, are slowly moving northeast about 2.5 cm per year relative to it. Thus this IRM is the weighted average (in the least squares sense) of the reference meridians of the hundreds of ground stations contributing to the IERS network. The network includes GPS stations, Satellite Laser Ranging (SLR) stations, Lunar Laser Ranging (LLR) stations, and the highly accurate Very Long Baseline Interferometry (VLBI) stations. All stations' coordinates are adjusted annually to remove net rotation relative to the major tectonic plates. If Earth had only two hemispherical plates moving relative to each other around any axis which intersects their centres or their junction, then the longitudes (around any other rotation axis) of any two, diametrically opposite, stations must move in opposite directions by the same amount. The 180th meridian is opposite the IERS Reference Meridian and forms a great circle with it dividing the earth into Western Hemisphere and Eastern Hemisphere. Universal Time is notionally based on the WGS84 meridian. Because of changes in the rate of Earth's rotation, standard international time UTC can differ from the mean observed solar time at noon on the prime meridian by up to 0.9 second. Leap seconds are inserted periodically to keep UTC close to Earth's angular position relative to the Sun; see mean solar time. ^ a b Malys, Stephen; Seago, John H.; Palvis, Nikolaos K.; Seidelmann, P. Kenneth; Kaplan, George H. (1 August 2015). "Why the Greenwich meridian moved". Journal of Geodesy. 89 (12): 1263–1272. doi:10.1007/s00190-015-0844-y. ^ "A manual on the technical aspects of the United Nations Convention on the Law of the Sea – 1982" (PDF). (4.89 MB) Section 2.4.4. The Abraj Al-Bait (Arabic: ابراج البيت‎ "Towers of the House (of God, i.e. the Kaaba)") is a government-owned megatall complex of seven skyscraper hotels in Mecca, Saudi Arabia. These towers are a part of the King Abdulaziz Endowment Project that strives to modernize the city in catering to its pilgrims. The central hotel tower, the Makkah Royal Clock Tower, A Fairmont Hotel, has the world's largest clock face and is the third-tallest building and fifth-tallest freestanding structure in the world. The building complex is metres away from the world's largest mosque and Islam's most sacred site, the Great Mosque of Mecca. The developer and contractor of the complex is the Saudi Binladin Group, the Kingdom's largest construction company. It is the world's most expensive building with the total cost of construction equaling US$15 billion. The complex was built after the demolition of the Ajyad Fortress, the 18th-century Ottoman citadel on top of a hill overlooking the Grand Mosque. The destruction of the historically significant site in 2002 by the Saudi government sparked international outcry and a strong response from Turkey. In geodesy, earth orientation parameters (EOP) are a collection of parameters that describe irregularities in the rotation of the Earth. The Earth's rotational velocity is not constant over time. Any motion of mass in or on the Earth causes a slowdown or speedup of the rotation speed, or a change of rotation axis. Small motions produce changes too small to be measured, but movements of very large mass, like sea currents or tides, can produce discernible changes in the rotation and can change very precise astronomical observations. Global simulations of atmosphere, ocean, and land dynamics are used to create effective angular momentum (EAM) functions that can be used to predict changes in EOP.The collection of earth orientation parameters is fitted to describe the observed rotation irregularities. Technically, they provide the rotational transform from the International Terrestrial Reference System (ITRS) to the International Celestial Reference System (ICRS), or vice versa, as a function of time. East India is a station on Docklands Light Railway (DLR) in Blackwall area of Poplar in London, England. The station is situated in the East End of London that takes its name from the nearby former East India Docks of the Port of London, where ships trading with the Indian subcontinent used to dock. It is on the Beckton and Woolwich Arsenal branches of the DLR, and is in Travelcard Zones 2 and 3. It opened, with the Beckton Branch, on 28 March 1994. The historic Greenwich Prime Meridian crosses the DLR at the eastern end of the platforms, which is marked by an illuminated blue line underneath the tracks at street level. The modern IERS Reference Meridian used by GPS crosses the tracks approximately 117 metres further east between Neutron Tower and Switch House, but is unmarked. Viewed from the same location, a star seen at one position in the sky will be seen at the same position on another night at the same sidereal time. This is similar to how the time kept by a sundial can be used to find the location of the Sun. Just as the Sun and Moon appear to rise in the east and set in the west due to the rotation of Earth, so do the stars. Both solar time and sidereal time make use of the regularity of Earth's rotation about its polar axis, solar time following the Sun while sidereal time roughly follows the stars. More exactly, sidereal time is the angle, measured along the celestial equator, from the observer's meridian to the great circle that passes through the March equinox and both celestial poles, and is usually expressed in hours, minutes, and seconds. Common time on a typical clock measures a slightly longer cycle, accounting not only for Earth's axial rotation but also for Earth's orbit around the Sun. A sidereal day is approximately 23 hours, 56 minutes, 4.0905 SI seconds (24 hours - 4 minutes + 4 seconds). The March equinox itself precesses slowly westward relative to the fixed stars, completing one revolution in about 26,000 years, so the misnamed sidereal day ("sidereal" is derived from the Latin sidus meaning "star") is 0.0084 seconds shorter than the stellar day, Earth's period of rotation relative to the fixed stars. The slightly longer "true" sidereal period is measured as the Earth Rotation Angle (ERA), formerly the stellar angle. An increase of 360° in the ERA is a full rotation of the Earth. Because Earth orbits the Sun once a year, the sidereal time at any given place and time will gain about four minutes against local civil time, every 24 hours, until, after a year has passed, one additional sidereal "day" has elapsed compared to the number of solar days that have gone by. The Tenerife meridian was the prime meridian of choice for Dutch cartographers and navigators from the 1640s until the beginning of the 19th century. 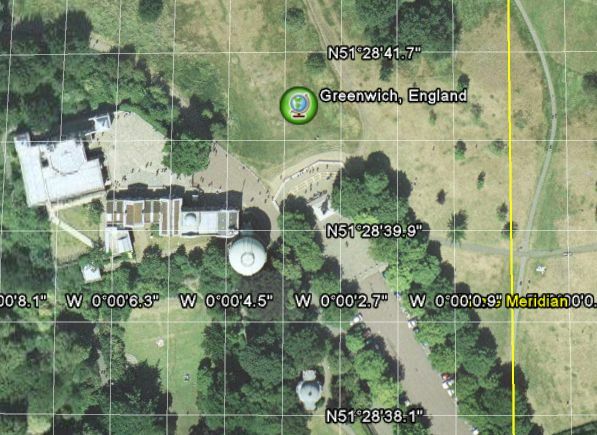 It lies at 16° 38′ 22″ W of the current international prime meridian, the IERS Reference Meridian through Greenwich. The World Geodetic System (WGS) is a standard for use in cartography, geodesy, and satellite navigation including GPS. This standard includes the definition of the coordinate system's fundamental and derived constants, the ellipsoidal (normal) Earth Gravitational Model (EGM), a description of the associated World Magnetic Model (WMM), and a current list of local datum transformations.The latest revision is WGS 84 (also known as WGS 1984, EPSG:4326), established in 1984 and last revised in 2004. Earlier schemes included WGS 72, WGS 66, and WGS 60. WGS 84 is the reference coordinate system used by the Global Positioning System.